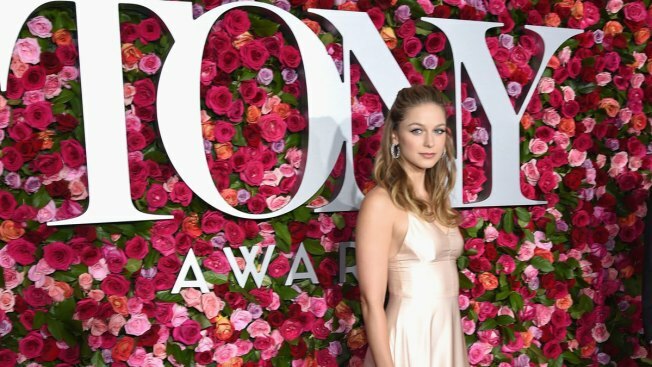 Melissa Benoist attends the 72nd Annual Tony Awards at Radio City Music Hall on June 10, 2018 in New York City. To get ready to play legendary songwriter Carole King on Broadway, Melissa Benoist had to learn her lines and complicated stage directions. Lyrics, not so much. The actress, who stars on the CW series "Supergirl," has been listening to King since she was a kid, fed a steady diet of classics such as "So Far Away" and "It's Too Late" from the landmark album "Tapestry" by her parents. "We would take road trips a lot as a family when I was a kid and each member of the family got to pick the music for an hour. My mom always put on Carole King or Linda Ronstadt or Joni Mitchell but mostly Carole King. So I definitely had a relationship," said Benoist. "Needless to say I didn't have any memorizing to do when it came to learning the songs." Benoist will take all the help she can get as she makes her Broadway debut Tuesday in "Beautiful: The Carole King Musical," which concentrates on King's early years. The role Benoist is stepping into earned Jessie Mueller a Tony Award. "It's like a roller-coaster every day because I'll have moments — high highs where I'm like, 'I got this!'" she said. "And then I have other moments where I'm watching someone else do it because I've been trailing backstage or I'm looking at the script and I think to myself, 'Why did I ever agree? Why did I ever put myself in this position?'" Benoist is closing a circle in a way. She grew up doing musical theater in Denver and sang during the last two seasons of "Glee." She got the offer to join "Beautiful" while finishing up Season 3 of "Supergirl" in Vancouver. "I never expected to be wearing a cape and in a flying rig and playing a superhero. That was just not on my radar. But I never, at the same time, gave up the idea of theater. It was always something that I wanted to come back to," she said. "So I almost feel like I'm coming home in a way." Benoist actually accepted the offer of spending two months on Broadway without first seeing the musical she was joining. She sought advice from Broadway veteran and "Supergirl" cast member Jeremy Jordan, and trusted her ears. "Who else could you say yes without seeing it but Carole King? You KNOW the music," said Benoist, laughing. "I would never forgive myself if I didn't say yes." Producers Paul Blake and Mike Bosner said in an email that they were "absolutely ecstatic" to invite Benoist to lead their show. "Then we saw her first performance and were completely blown away! She lights up the stage whenever she walks on." Benoist's stint on Broadway is limited since she's due to return to film Season 4 of "Supergirl," but Benoist said she'll go back to a far different set environment than a year or so ago. Warner Bros. suspended Andrew Kreisberg, an executive producer and show runner of "Supergirl," after sexual harassment and misconduct allegations were made against him. He has denied any wrongdoing. Benoist calls the new set environment "really conducive to equality and everyone has a say and that is something that I felt change and going in the right direction," she said. She added that the "Supergirl" family is careful to discuss "what we're saying to young girls, what effect it's going to have on them, what it means." "So the fact that that's a part of the conversation every day makes me really happy," she said. While she's hopeful that "Supergirl" and Carole King fans will come out and see her sing at the Stephen Sondheim Theatre, Benoist is a little worried about one person possibly showing up. That would be Carole King herself. "I wouldn't want to know until afterward because I wouldn't be able to sing for her," said Benoist. "I can't imagine singing for her — her own music, especially. But I hope I get to meet her. I would love that."